Angular Material is a library of reusable and high-quality UI components that are built with Angular and TypeScript. These components are internationalized so users with different languages can use them. We have a clean and simple API. They are well-tested with unit and integration test. They are customizable. They are very fast with the very minimal performance overhead and they are almost well documented. So, let’s see a few examples of this component in action. So, go to this link and open the Angular Material Components. We can see we have various kinds of components. We have Form Controls, Navigation, Layout, Button & Indicators, Popup & Modals, and Data table components here. So, let’s see a few of these in action. So, click on Form Controls and you’ll see this page. Now, click on Checkbox and click on the Examples tab of the checkbox. We can see checkboxes and radio buttons in action. So, these checkboxes have the same API as the native checkboxes we use in Angular. But you can see they’re looking pretty. And if you click on any checkbox, they also have nice animations. And we can use them very nicely in our application by using Angular Material. Similarly, here, we have modals & popup elements in the different component with very nice animation. And if you explore the examples of different components here, you’ll be the huge fan of Angular Materials. Angular Material, on the other hand, is built specifically for the Angular applications. So we don’t have to do anything magical. We can simply import the module and use Angular Material components just like how we use custom components. Also in terms of statics, Bootstrap have different design language. 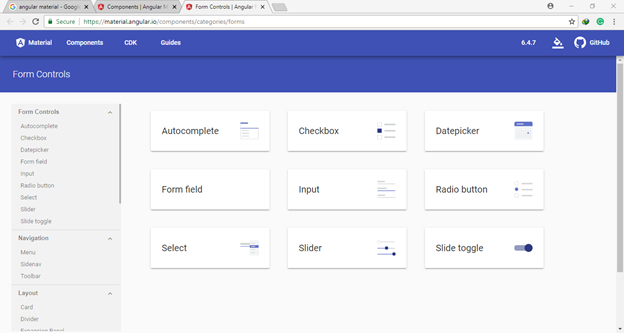 All the bootstrap components have a different look and feel whereas Angular Material is based on the Material design which is a visual language developed by Google in 2014. This is the same language that you see on Google Plus, in Android and many other applications. So, the answer to the above question is we can use bootstrap, we can use Angular Material, we can use both. You might see many articles and tutorials working with md- prefix component selector. But now it is depreciated. So, don’t confuse. We’re using mat- prefix here. So, let’s see how to install Angular Material. Here are the steps to install the Angular Material in your project. So, let’s see these steps in action. @angular/cdk stands for Component Development Kit which is one of the dependencies of Angular Material and it is basically a library that allows you to build awesome components for the web but without adopting the material design visual language. 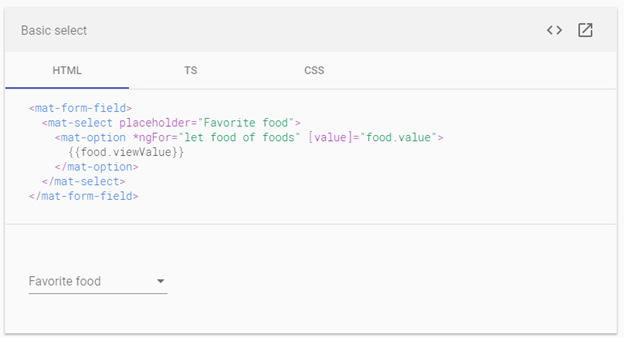 So if you wanna build a reusable data table that doesn’t necessarily have the material design visual language, we can build it with cdk in an agnostic way. @angular/material this is the actual @angular/material package. These 2 are the essential packages that we need to install. Now optionally we can install a couple more packages 1 is for adding animations and the other one is for the gesture. For gesture support, we need to install hammer.js. So, hammer.js is the powerful library that allows you to add gesture support to your pages. But again, it is an optional dependency but I would recommend you to add it to your application. So here, we have a bunch of themes. But we’ll use indigo-pink.css. And you can use any other you prefer. Let’s go to styles.css and here we need to import them just like we imported bootstrap before. We add the relative path of node_modules. Make sure to spell it properly, otherwise, it is not gonna work. Now, go to the app.module.ts. Here if we wanna add animations support, we need to import BrowserAnimationsModule. So now, we need to import one of these Modules (BrowserAnimationModule, NoopAnimationsModule) into our NgModule. And here, we have imported BrowserAnimationsModule in the imports array. So, these are the 3 steps we need to follow in order to install the Angular Material. Now, to make sure we have installed Angular Material properly, let’s go ahead and add the checkbox into our component. So, let’s go to app.component.html and delete all the markup here and add the checkbox and give it a label. So in Angular Material, we have a custom component for rendering the elements and this md-checkbox is the selector of checkbox component of Angular Material. Now, run the application. Now, let's get back in the browser and here, we get the blank screen. We know the meaning of the blank screen - we have some error in the console. So, the error is ‘mat-checkbox’ is not a known element because we have used the custom component but we have not imported this component into our app.module.ts. So let’s go back to app.module.ts. And now, add it in the app.module.ts. And now, we have a beautiful modern checkbox with animation. So our custom checkbox in Angular Material also has these properties. So once again, if you open this link, you can find all the properties implemented in this component. I’ve attached the link of API/Directives, here you can see the name of the component and all its input and output properties, methods etc. There is not enough time to go through each of these properties but let’s discuss a few key properties that you’re going to use in a lot of real-world applications. Or we can use property binding. And if we want to make it dynamic then obviously we have an option of property binding syntax. Now if you open the browser. You’ll see checkbox is checked. We also have change event that we can subscribe here. Now let’s suppose we have a div on the view and we’re using checkbox to show and hide the details. Now back in the browser. Now toggle the checkbox and watch the effects. And if you click the view source, you’ll see the markup that you need to write to render this component. As we can see in the picture, we make the radio-group. Inside that radio-group, we place the radio controls to make only one selectable there. And of course, we may have many radio-groups on 1 web page. And of course we can use property binding syntax here as well like we do before with checkbox component. And here Female is checked by default when you open the browser. Whenever you use any Angular Material component, make sure you import the module first in app.module.ts. Under component API tab you’ll find the API reference import statement to enable working for that specific component which you wanna use. If you look at the documentation for this radio button, here we have some input and output properties. Here, we also have a value input property. So we can set the value of the group and this will automatically check the radio button with that value. Let’s see in action. This will automatically check the female radio button in the browser. You can see how these components are really very easy to use. Now let’s see how to render the drop-down list, here is the link. I’ll not repeat the things which are the same in each component. Now, you know 70-80% about Angular Material. They are actually very easy to use. Let’s go to the overview tab and look at an example. Look how much they are really very simple to understand. This code is very similar to the native select an option element we have in HTML5. Now let’s come back to app.component.html and add a native html5 drop-down list and then convert it to an Angular Material drop-down list. Now, let’s print the options based on the array list. So come back to the component. Now, back in the template and here we gonna apply ngFor directive to repeat these array options. So, this is our native html5 dropdown list. Now, if you see the result in the browser. We got something weird. But we can do better. So, let’s convert it into the Angular Material dropdown list. So, first of all, verify the dropdown list component in app.module.ts. Now, back in the browser, it will not be visible to you. However, we don't have any error message in the console. So, don’t confuse to see the white screen. It is not actually white. It has a dropdown list with maximum width. Now, let’s pre-select one of the items here to make it more clear to you. And to pre-select we need to use ngModel directive. Now, let’s define the color property. Now, let’s open the browser and see what we get. 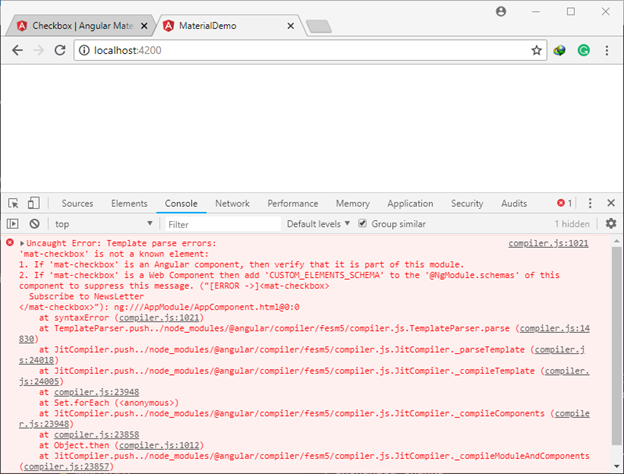 We got an error because ngModel directive is defined in the forms module and because this is the brand new Angular project and we have not imported the forms module. So back to app.module.ts and add the FormsModule in imports array. Now, we have green selected by default. 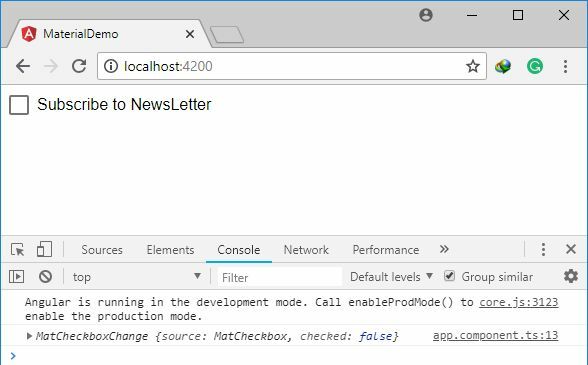 So, to convert the native HTML 5 dropdown list to an Angular Material, all we have to do is to prefix the elements with mat-, very easy. 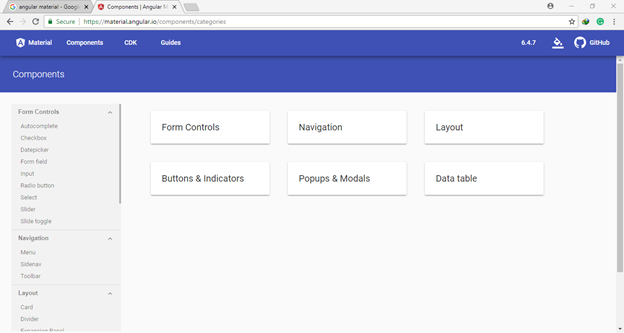 Now, let’s see how to work with Angular Material input controls. Let's take a look at the markup. So here, we have a form containing mat-form-field with plain html5 input elements. These input elements have a directive mdInput. You might be thinking why we need from here, because we may have a few other elements as well here with input fields, we can have error messages so we put all these inside forms. It is very near to our plain HTML code. Now back in the browser, make sure that you’ve added component module reference in app.module.ts. 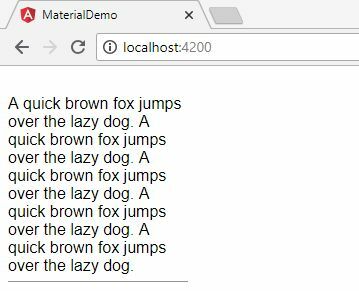 And after all the verification and if we’re correctly working according to the guidance of angular material documentation, it will show us the results in the browser. And here we get an input with username placeholder successfully. Now, let’s take this form to the next level. And here is the result what is going on with this form code. Now, let’s add the form validation on the form. Previously in the article of Template driven forms, we used div to the couple of bootstrap classes for rendering an error. We used alert and alert-danger. 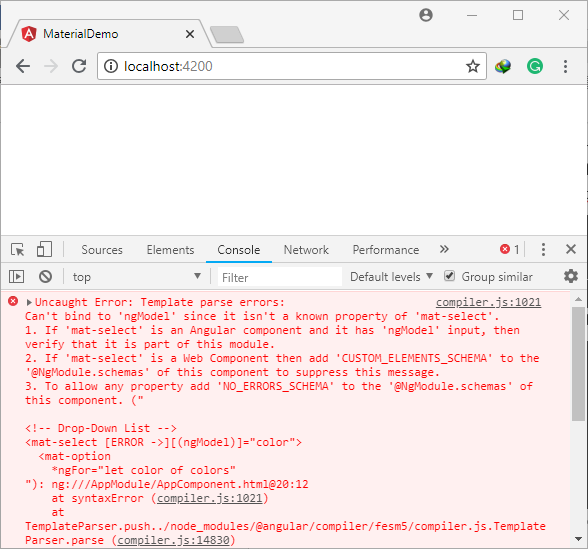 But here, when using Angular Material, we use mat-error and by the way make sure not to use bootstrap classes here for example adding a class form-control to input field. We should not add these classes because it will mess up with the appearance of your Angular material components. So you should either use bootstrap or Angular Material when you’re building a form. Here, we have 2 methods to add the validation error. Now, with the help of this code, Angular creates the formControl object and associated with this input field. Run the application and leave it blank we’ll see red error message. With this, we can have multiple errors of different kinds. Now, let’s see the markup result. And now, the 2nd complex approach is using Reactive Forms. And now, our component code is like below. But this code will only work if you have import the reactive forms module in app.module.ts. So what we had learn about input fields also applies to text area elements. Let’s see an example with plain html5 textarea element. It will give us this output. Now, to give this material design look and feel. But when we put a lot of text inside, it contains the scroll instead of auto resize. So here we have also the solution to this problem. Under the API tabs under the list of directives, we have interesting directive matTextareaAutosize. So, we can apply this directive to the textarea and this will automatically resize that textarea to fit its content. Now that we know how input fields work in Angular Material. 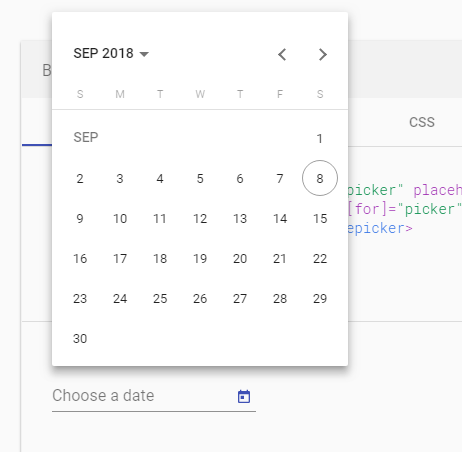 Let’s take a look at the Date Picker component. 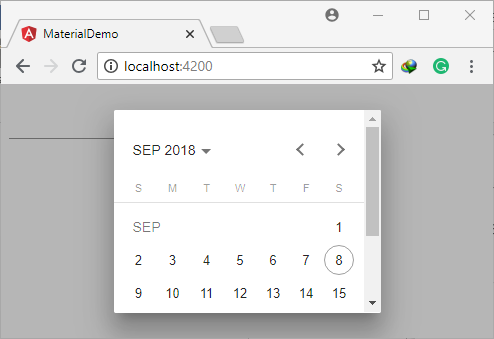 So here, in the Angular Material website, look at this date picker so here in app.module.ts, we’ll import MatDatepickerModule. If we click on Choose a date icon right side of the control. Look how beautiful this datepicker is. Now, let’s take a look at the markup of the datepicker. 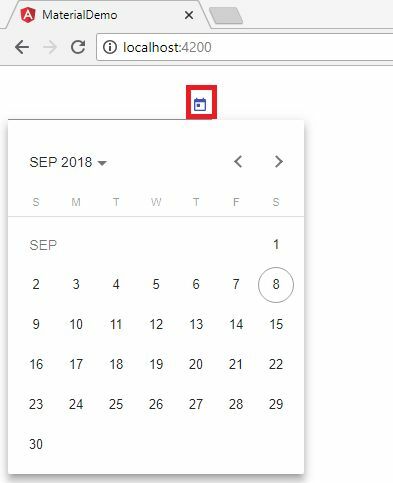 Open app.component.html, if we’re working with form then obviously this datepicker is just a single form control of that form. 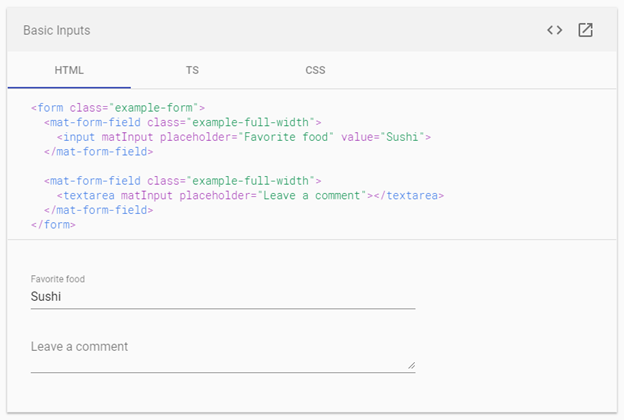 And we put the angular material components in the form element. 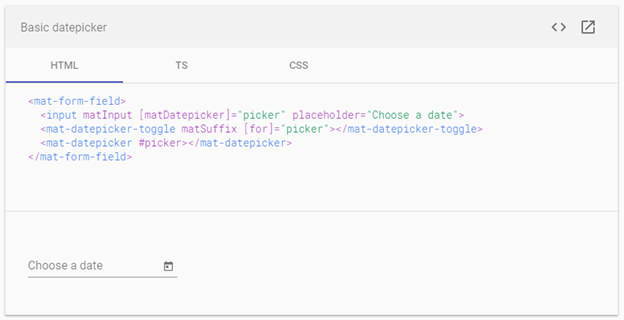 Now, we need to connect this datepicker to this input field, we created above to the mat-datepicker. So first we need to assign a variable to the mat-datepicker. And then on the input element we apply. So in this way, we linked these 2 elements. Now, let’s test the application in the browser. Let’s add an icon, like the icon of the calendar. 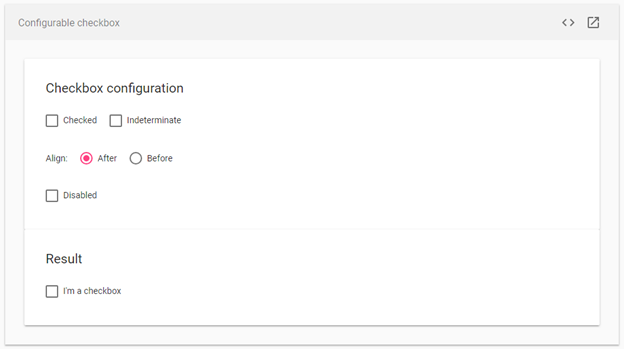 So we’ll follow the documentation examples, we’ll add the toggle icon here. And look, it is working. This calendar popup has 2 modes (month and year) and by default it opens in the month mode and we can see all the days of the current month and we can click to Sep 2018 to switch to year mode where we see the years and all the months inside any year and if you click on current passing year, you’ll also notice the current month is selected. So let’s have an experience your own. We can navigate back and forward with the help of left and right arrow symbols. Now let’s minimize our browser and simulate the environment for the mobile view. This is not the good user experience because it is showing us half datepicker control. So let’s see how to solve this problem, back in app.component.html here on the mat-datepicker element we need to set touchUi attribute to true. Now back in the browser, and now it is the better result. So make sure to always check the touchUi to true. Now, let’s see a few other functions of this datepicker. 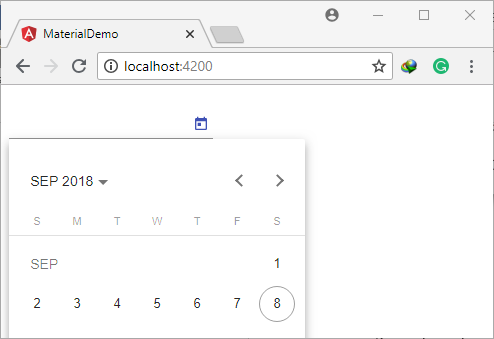 By default, we don’t have a date in the datepicker input fields and when we click on the datepicker, it popups with the current day selected. If we manually write the date in the input field and click on the datepicker, our manually written date will be selected in the popup. Add these fields in AppComponent, intellisense will automatically guide you what is the year, month, and date arguments here. Now, come to the HTML template. Now, let’s see what happens in the browser. 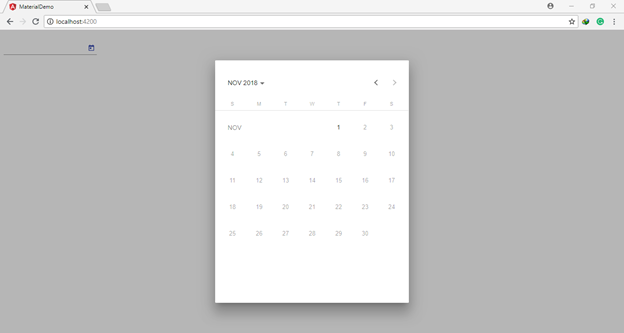 All the days after 1st of November is disabled but this is currently a bug in the datepicker component. Because we’ve set the maximum date as 1st October, but it is working with next month (November) with the same day. Hopefully, in the next release, it will be fixed. So this is the simple bug in how the datepicker calculates the min and max dates. Another thing that is not implemented in datepicker is displaying an error when the user adds invalid date manually, i.e. Again this is an issue in Angular. And if you want to head over to the issues on GitHub. Here is the link to be updated. And it is showing us this result in the browser. Now if you want to change the color of these icons. There are 2 ways. For now, let’s how to use CSS to change the color of this icon. We’ll explore themes later in this article. So, let’s go to app.component.css, here we can apply the style to our mat-icon. So, let’s see how to work with buttons. Just like always, let’s start with app.module.ts and here we import. So, this is what we get in the browser. And if you hover this ‘Click Me!’ it will look like a button on hover. But by default, it doesn’t look like a button and I personally recommend you not to use this directive. Now let’s take a look at another directive. This is much better. By default, the background color of this button is based on the background color of the theme. And the theme we have applied here has the background color white that’s why the background color of this button is also white but we can change this. We can simply apply the color attribute. And here we have 3 options (primary, Accent, warn). If you have worked with bootstrap, you have seen the same concept there. In bootstrap, we have primary secondary danger and so on. So let’s use a primary color of the button. Now let’s copy paste a couple of times and check the colors. And our result will be. So, these are 3 beautiful buttons based on the current theme. Now, what if we don’t like these colors? What if instead of this blue-purple or primary button, we want to look the primary button as green. There are 2 ways to achieve this. One way is to use CSS which is not recommended. Because you want your entire application to have a common and consistent look and feel. If you have green use in your button, chances are that green should be used somewhere else as well. That’s why in Angular Material we have this concept called Theme where we define all the colors in our application. And that’s something we’re going to look later on. So, for now, don’t worry about to change the color of these buttons. Now, let’s take a look some more types of button. Here, fab stands for floatable action button. These are round buttons that have an icon inside so we don’t add the label here but instead we add an icon. Let’s see its results. And if you’re watching this check button or the color might be purple or red. Then you should move to app.component.css and remove the styles which we have applies to mat-icon. We can also change the color of this fab button. And now the color is changed in the browser. 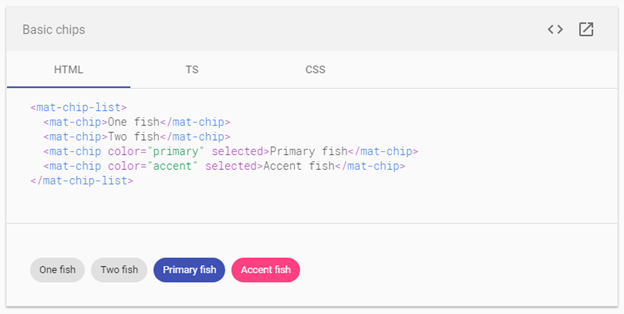 We have another useful component in Angular Material called Chips. We use chips for some kind of tags below an object or product and we can use them to implement some kind of filter. Add the module in imports array and add the reference with an import statement. Now let’s go to app.component.html and I’ve already shared the example picture to generate the chips. Now define the chips in app.component.html and make it dynamic. This code is very easy to understand. On category click event we’re just changing the state if this specific category is selected then it will become unselected and if it is not selected then it will be selected. And selected property binding is for maintaining the state of the item. So I click on the Beginner, it becomes selected and if I click again it will become unselected. But now, we can select more than one categories. And we want to make them selectable only one item. So instead of using an expression now, we use the component function in the click event. And now let’s define the method. // forEach: then iterate them and make them not selected. And now, only 1 item is selectable. And everything works beautifully. Another useful component that you have seen in a lot of real-world applications is progress spinner. And import the module in the import array. So in this mode, we should also set value property 20. And here we get the result. Now, back in app.component.html. Instead of hard coding 20 here, I’m gonna bind the value property to the progress field in our component. Now, if you see this in action, you’ll see the beautiful progress bar in action in the browser. Now, this progress spinner also has another mode which is indeterminate. And that is when we don’t know the progress of an action. For example, when we call the API on the server, we don’t know how long it is going to take and get the response. So we wanna display this spinner until we get the response. In this mode, we don’t any need to set the value property. And we’ll see continuously rounding spinner on loading the browser page. So in order to call the server, we use our data service. So that data service is going to be a dependency to this constructor and in the ngOnInit() we call the data service to get the data. Technically, getCourses() should not be here in the component to be a part of the services, like data service but we don’t want to waste the time of that service. And we know our data service returns Observable. So here, in our getCourses(), timer() is returning observable and then we have subscribed it in the constructor. timer() is a factory method which returns observable after every 2 seconds, it simulates the call to the server that is going to take 2s. So here, in our constructor, when we call getCourses(), we’re gonna wait 2 seconds and then we’ll get the result but in our case, there will be no result because we’ve not any list of courses and it doesn’t really matter. So, let’s simplify. Of course, in a more real-world scenario, here we also want to set the courses field in our component. Now, back in our app.component.html template, we want to display this spinner only when progress spinner is true. Now, see the result in the browser. We’ll see the progress spinner which will disappear after 2 seconds.